If parents teach their children to treat the nature with care and respect, and explaine the results of our activities on the planet, many of the environmental problems will be solved easily. This will be a great step to making the Earth a better place. This Bigfoot lesson was developed by the Science Alberta Foundation, a non-profit organizatin dedicated to the promotion of science education at all levels, and was taken from their great book “Backyard Safari Activity Guide”. Do we have an impact on our environment? Yes! Positively, negatively and often with little effort. This activity will demonstrate that even just “standing around” can affect the lives of many living things.This activity will work best on a warm spring day, but could be done anytime of the year. 1. Draw an outline of someone’s foot in your group. Cut out the foot shape from thepage and discard it. The foot “hole” is waht will be used. 2. Ask the children to work in threes. Give one bigfoot and a magnifying glass to each group of three. 3. Give each child a pencil and paper. 4. Have each group go outside and place their bigfoot on the ground. Ask them to examine the space in the footprint with a magnifying glass to see what living things they find. 5. Encourage them to draw a map of what they see. 6. Discuss iwth all the groups what might have happened if this had been a real foot. What life would have been disturved or killed? 7. Discuss how our actions affect other living things. WHat kinds of actions have negative effects? What kinds of actions have positive effects? What can we do to minimize our impact on the environment? Extension: Are some areas more sensitive to the presence of humans than others? 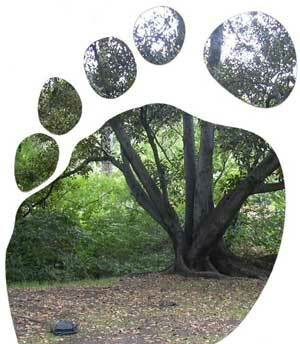 Try the bigfoot activity in different locations. Compare the results from various areas. Are more things disturved in certain kinds of areas than others?